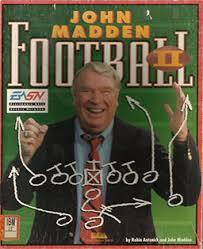 Hillside, NJ ~ Have you ever played Madden? After the first sentence some of you maybe asking what does Madden NFL Football have to do with ascots (Sterling Ascots to be specific)??? 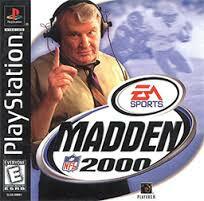 I can still remember being a kid in junior high, firing up Madden 2000 Franchise Mode. My first trade was always dumping Dedrick Ward in a lop-sided trade to bring Keyshawn Johnson back to my beloved New York Jets. 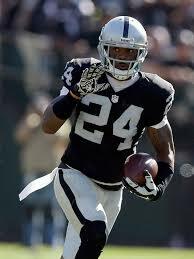 My second lop-sided transaction, dumping corner back Ray Mickens like clockwork for future NFL Hall of Famer, ESPN Analyst, and Ascot enthusiast: Charles Woodson (rated 94 as a CB in Madden 2000). Thank you EA Sports for the trade override button! When it comes to the game of football, there isn’t many things you can count on. Having a long and successful career is slim, the Hall of Fame is for a select few, and the Super Bowl….you can ALMOST forget about it unless you’re practically on the Patriots, Steelers, or Giants, and occasionally the Packers. Charles Woodson has defied a lot of these rules. Woodson played both offense and defense for the NCAA Michigan Wolverines. Then in 1997, he helped Michigan win the NCAA College Football National Championship. He was then drafted 4th by the Oakland Raiders in 1998 and given Defensive Rookie of the Year honors and earned a trip to the NFL Pro Bowl with 64 tackles and 5 interceptions. Lets not forget, he has a championship ring after winning Super Bowl XLV (45) with the Green Bay Packers. Last but not least, Woodson has played in 18 NFL seasons (98′-15′ beating Father Time) and is arguably in the conversation as a top 5 cornerback in NFL history. 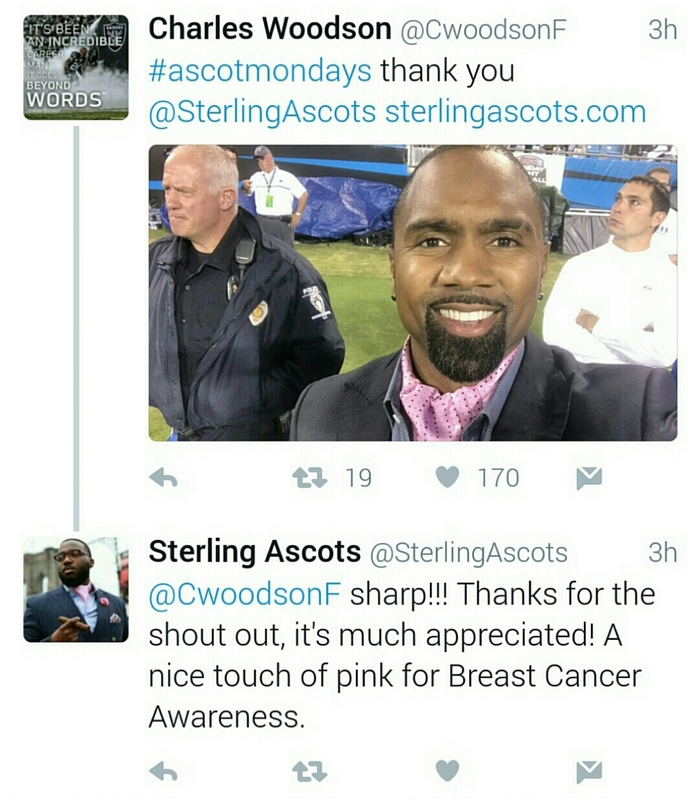 Woodson was a phenomenal football player but here at Sterling Ascots we are biased. Although Woodson is well known for his play on the football field, he is now beginning to become known as a man who is helping to advance the ascot culture off the field. 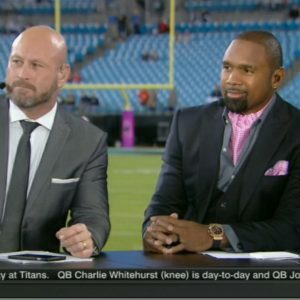 As the owner of Charles Woodson Wines (CharlesWoodsonWines.com) in Napa, Mr. Woodson can also be found in an ascot on ESPN NFL Countdown on Monday nights from 6pm – 8:15pm EST. To all of our customers who purchase our ascots in Northern California from Feb to April, make sure you check out Charles Woodson Wines. Here at Sterling Ascots, one thing we’ll never forget is the day Mr. Woodson brought Sterling Ascots to ESPN airwaves. 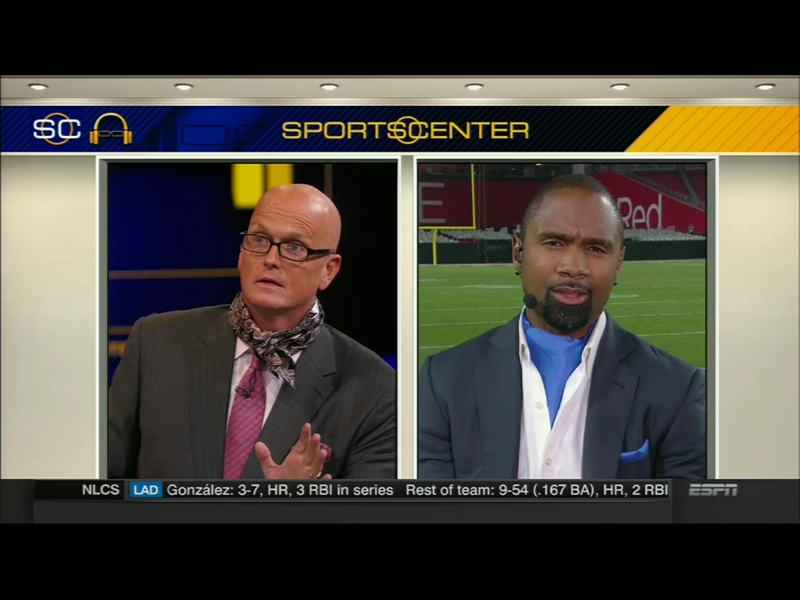 At the conclusion of week 2’s Monday Night game Woodson told Sports Center’s, Scott Van Pelt, that he would continue to wear an ascot every Monday night. Once we saw this, we felt that it was worth a shot reaching out to Woodson and offer him some of our ascots. 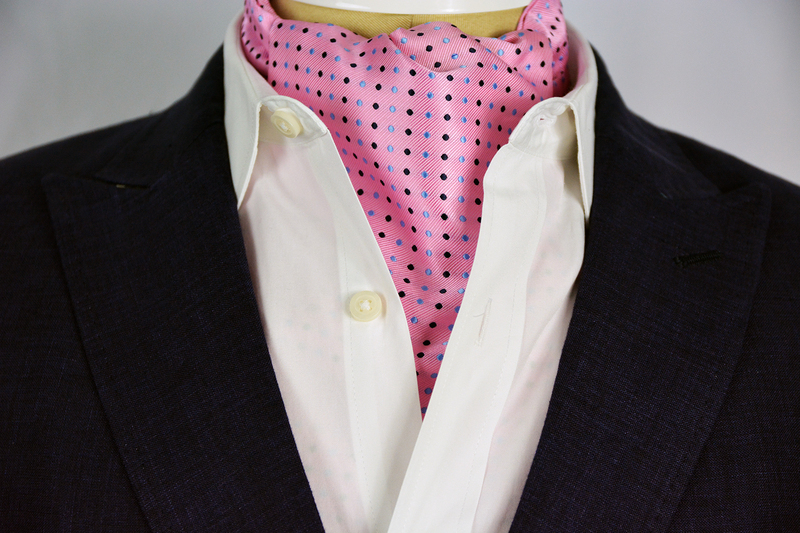 After successfully contacting him, he was kind enough to introduce our Polka Dot Pink Sterling Ascot on a national stage via ESPN during Breast Cancer Awareness month. 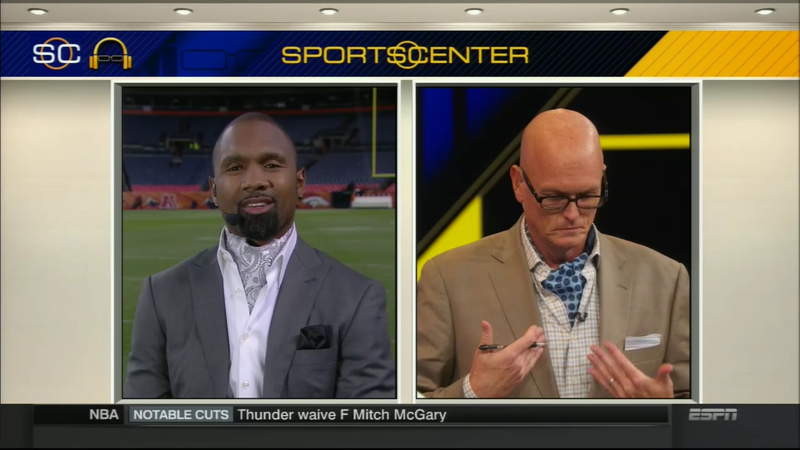 In the weeks that followed, we were pleasantly pleased to see our Monte Carlo Sterling Ascot around the neck of Scott Van Pelt during a post game interview with Woodson. 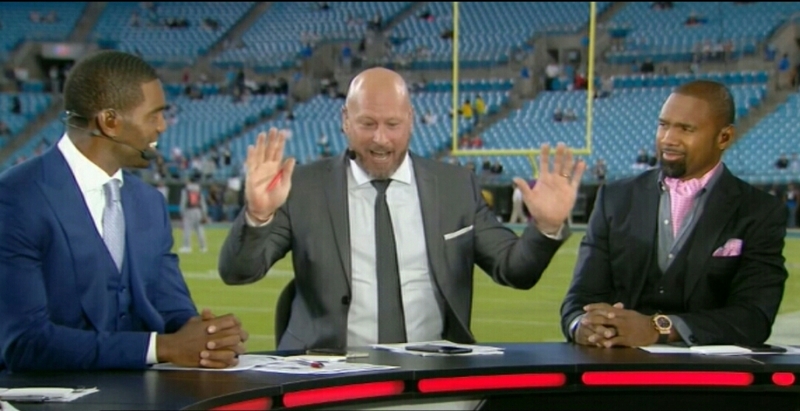 During that post game interview, Mr. Woodson was kind enough to verbally shout out Sterling Ascots on the air. Soon after Scott Van Pelt announced that he would present another ascot, tied properly, during the post game interview of Jets vs. Cardinals. Sure enough, the following Monday while in Vegas at the craps table, I look up at a nearby TV only to see Scott Van Pelt wearing the Bubble Blue Side of the Sterling Navy Reversible Ascot for a full segment. From these three instances and a personal shout out from Mr. Woodson on his twitter and Facebook page, Sterling Ascots gained recognition as ” Charles Woodson’s ascot guy” from ESPN platforms: Mike & Mike’s morning radio show as well as the Michael Kay Radio Show. We consider this a solid start on a journey we hope lasts a number of decades. 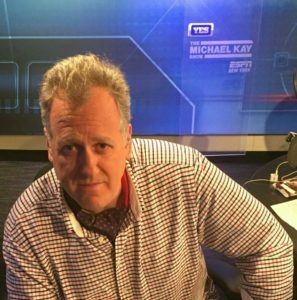 Although we failed in getting Scott Van Pelt to commit to adding the ascot to his personal wardrobe, we have somehow convinced radio personality: Michael Kay to try on an ascot live on his radio program this past Thursday, December 1st. Michael Kay has been completely against ascots but in honor of Charles Woodson’s dedication to the ascot lifestyle, he has agreed to give the ascot a legit shot during his weekly Monday spot on December 5th with Steve Young at Metlife Stadium (Jets vs Colts). If you’re in New York, you can catch the broadcast on 98.7 ESPN radio or on the YES Network, simulcasted on television, from 3pm to 7pm Monday to Friday. When it comes to ascots, people will either love them or hate them. There are no “in-betweens’ or ‘gray areas’ to how people feel about ascots. 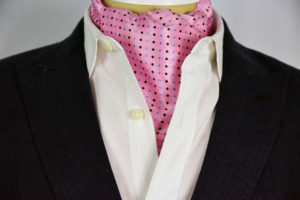 So when we see people in the public eye wearing an ascot, it does a lot for the ascot culture moving forward. After having our website up and running for roughly 13 months, we are content but never satisfied with our efforts to progress the ascot culture. We’ve identified that there is a niche market for ascots but without the power of television, social media, and entertainment, this market will not grow. As we continue to blog about our international experiences, we also want to shine the spotlight on individuals in the entertainment who decide to wear ascots. Without them, ascots remain dormant.